My mom is an amazing cook who loves to give everyone plenty of options. Since she’s always feeding a crowd of 14, it is hard to please everyone, but she certainly tries. A holiday dinner just isn’t a holiday dinner at my parent’s house without a jello or fruit salad, usually both. I’m not going to lie, I love them. It is an easy way to have dessert during dinner. For Easter, my mom made two salads, including this Lemon Marshmallow Fruit Salad. The recipe came from a church cookbook from at least 30 years ago so I’m not really sure where this recipe originated. I actually had to rename it because it was called Lemon Filling Salad. (Seriously, what kind of name is that?) Regardless of the name, this salad is super refreshing and because it uses canned fruit, it is perfect for any time of year. I used regular sweetened coconut for my garnish, but toasted coconut would be even better! If you don’t know how to toast coconut, it is super easy. You do need to keep a close eye on it because burnt coconut is awful, trust me. 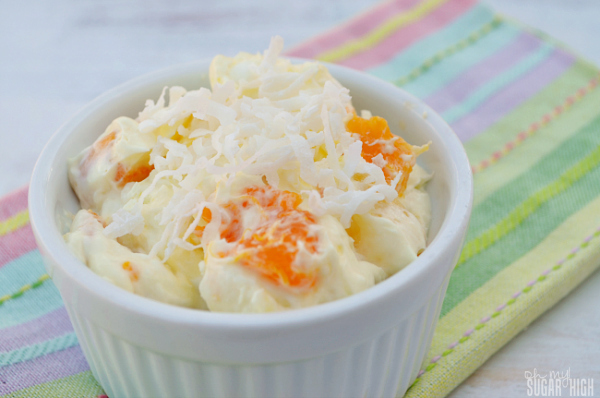 To toast coconut, bake coconut in a single layer on a cookie sheet at 350 degrees. Bake, then stir, every 2 minutes until lightly browned. If you start to see any color at all you know you are close and check it every 30 seconds after that. You can definitely skip the coconut and nuts if you prefer. They are a nice touch and certainly add a bit of crunch, but not necessary. This is quick and easy fruit salad is a perfect accompaniment to any meal, especially for spring celebrations like Easter and Mother’s Day! Who says you can’t enjoy dessert during dinner? This looks wonderful. I am like you, I am big fan of these types of salads! 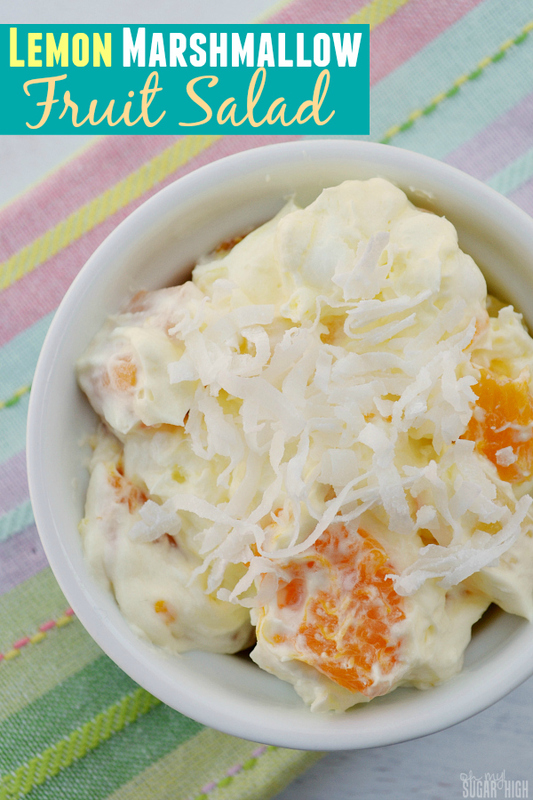 Lemon Pie Filling….who knew it would make such a yummy looking salad! Pinning now! We would love for you to join us at Party in Your PJs, our weekly link party. I’ve never heard of lemon pie filling, but this looks delicious! Yummy! Thanks for sharing your fruit salad recipe! I found it at Inspire Me Mondays!